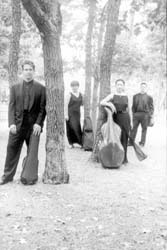 Formed in 1989 by four young musicians from the Curtis Institute of Music in Philadelphia, the Borromeo String Quartet is considered one of America’s leading young quartets. While it continues to break new ground with the performance of contemporary works, it is also drawn to the more classical repertoire, especially Beethoven. Winner of the first prize at the 1990 International String Quartet Competition in Evian, France, the quartet pursued this blazing trail, convincing the jury of the 1991 Young Concert Artists International Auditions--in 1992, the winners were the St. Lawrence Quartet. In 1998, the quartet received the prestigious Cleveland Quartet Award. The Quartet is now on the faculty of the New England Conservatory of Music as Quartet-in-Residence. The experience for the listener should also be renewed with each performance of the works. “No matter how many times you perform or study the score,” says Fedkenheuer, the young Canadian who joined the group just last year, “there seems to be always something new you either never heard before, or thought about in quite that way. The many different versions attest to the fact that many quartets are still discovering this music throughout their lifetime. Their importance as a cycle is immeasurable. I would venture that anyone who has listened to a complete cycle would agree that individually they are each their own masterwork . As a cycle, each adds to the power (musically and emotionally) of the others. The relationships within each work extend beyond into each of the other works and it is quite exciting to discover these connections”. Chamber music could very well be the fastest way to the audience’s heart, as long as dedicated musicians keep on believing that anything is possible. Due to the recent events, the release of the Beethoven CD might be slightly delayed. For more information, visit the quartet web page at <www.borromeoquartet.org>.